Online Speech Therapy Help: Language Nutrition: Getting the ingredients right! A common theme that a parent comes across in parenting articles is that of nutrition and healthy eating. But not often does one come across the term "Language Nutrition". Language Nutrition is a term coined by Lauren Head Zauche. Lauren and her team looked at 103 research studies to learn about how children learned language and what ingredients went into creating a wholesome experience in "Language Nutrition"
So how do parents know that they have the right recipe? Lets take a look at this interesting concept and what goes into getting the recipe right. Children take about 7 years to get up to the same level as a native language speaker in any language. The early years (0-3) are the best (although not limited to age 3) for stimulation and facilitation as they help lay the foundation for more advanced language development. Language nutrition consists essentially of "language-rich interactions" that facilitate development. The following are 9 key ingredients to creating a rich, stimulating language environment. Some studies say babies need to hear atleast 30,000 words a day. That can seem like an imposing figure for a single caretaker to provide, but constantly talking to the baby helps. However not only does the quantity of speech matter, the quality and variety counts too. Children need to hear all kinds of describers, action words, nouns, pronouns, greeting words and question words to learn the complex aspects of language. Those children that have a wider exposure to rich language tend to have bigger vocabularies, use longer sentences and have better refined grammatical skills. Language researchers have studied the way mothers or caregivers speak to infants around the world and they coined a term for this type of interaction. The term is "Motherese". Motherese is also called Baby talk. Sometimes it is referred to as child-directed speech (CDS). BabyTalk is usually delivered with a "cooing" pattern of talking different from that of normal adult speech. It is usually high in pitch, with many tone variations that are more pronounced than those of normal speech. Talking to your baby as soon as the baby is born is supremely important. Newborns can recognize the familiar voice of their mother. Talking to a baby might not come naturally to many parents. But with a little bit of practice, it can be the basis of a life long investment in the cognitive and emotional development of the baby. Talking to your baby with simple words, using simple sounds, speaking in an adoring way, speaking to the baby with the assumption that the baby understands are all critical to a baby's brain development. Parents that are more expressive with their hands and facial expressions and use gestures tend to have better outcomes for language abilities in their children. Babies pick up on signs very early on. In fact some infants develop their own variety of personal signs before they can even say any words. So move your hands while talking your child, point to things, show actions with your hands for words like "open". Language cannot be learnt in a passive environment. While the child tries to communicate the adult should be attentive, observant and finally responsive. The back and forth nature of communication is what is a critical part of responsive interaction. Pay attention to the child's topic of conversation. Motivating social interaction is highly dependent on what the child likes to talk about. Quizzing a child to test their knowledge doesn't not lead to a good communication experience. Also changing the topic to a topic that the adult has "predecided" to discuss will not lead to good outcomes. With sensitive caregivers who set a positive tone for engagement, children develop language more consistently and reliably. Telling a child what to do and using a negative tone were related to poorer outcomes for language and cognitive development. Playing with your child has a direct correlation with the extent of language and cognitive concepts your child learns. Engaging in fun learning activities not only helps language development but also helps with trust building and emotional security. Sharing books is a fun way to encourage vocabulary, language complexity, and other cognitive skills of reasoning and thinking. Books are now available in a variety of accessible formats, print, digital and audio books. 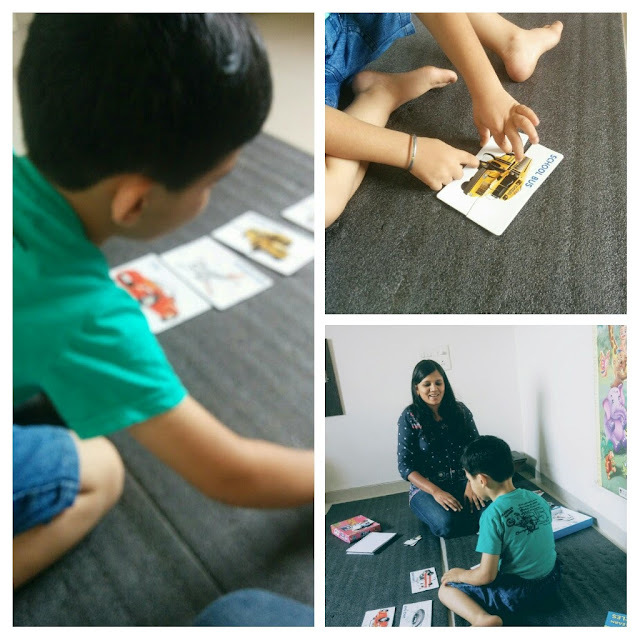 No matter which format you pick, best language outcomes result from books that are of a topic that interest the child and one that you can rejoice together either by listening to it being read out, or reading it to the child, or helping the child if he needs help with reading. Children loves stories. Choose from personal ones from your own childhood, made up ones, mythological stories and fantasy tales. Stories are a fertile ground to lay concepts, build imagination and help children express their thoughts and ideas in words. Children like to be introduced to a variety of social interactions, not limited to children of their own age, but people with a variety of ages. So family, friends, cousins, grandparents all can play a tremendous resource for providing a rich context for learning and navigating social communication. With these 9 ingredients in place you have a sure shot recipe for laying a successful foundation for strong language skills in your child. Head Zauche, L., Thul, T. A., Darcy Mahoney, A. E., & Stapel-Wax, J. L. (2016). Influence of language nutrition on children’s language and cognitive development: An integrated review. Early Childhood Research Quarterly, 36, 318-333.